This is a rather cryptic letter to Mr. Sibley from Miss Berry. 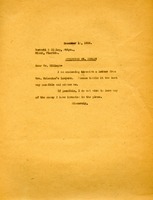 In this letter, Miss Berry tells Mr. Sibley that she is sending a letter to him from Mrs. McLendon's lawyers and tells him to handle it the best he can. The letter is somewhat cryptic to the reader (us) as we do not know what the situation was. 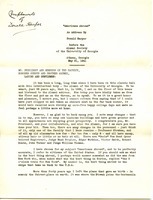 A copy of "Americans Abroad," Donald Harper's address to the University of Georgia Alumni Association.